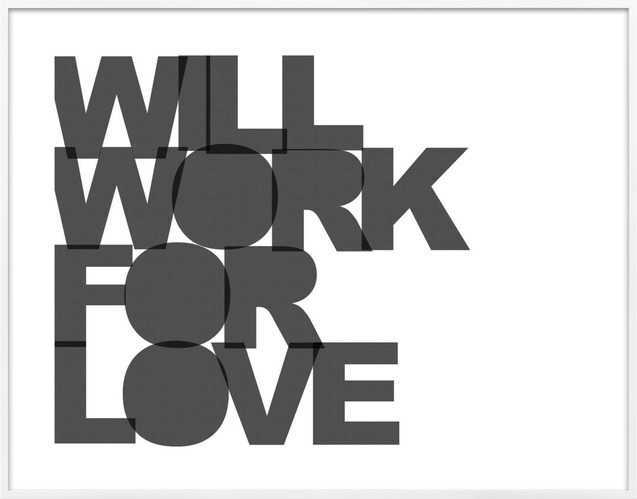 Learn more about Work For Love from BRONCO. The simplicity of this message belies its many interpretations—a signature of Bronco's clever word-play. His overlay of letters adds an abstract dimension to his graphic style. Bronco is a Berlin street artist best known for his urban interventions, which subvert traditional advertising platforms with irreverent and philosophical slogans. Born in a small harbor town in Northern Germany that was home to a U.S. Military base, Bronco was exposed early on to authoritarian culture. He started doing graffiti as a youth, before moving to Berlin where he got involved in the electronic music scene and began collaborating with other street artists.